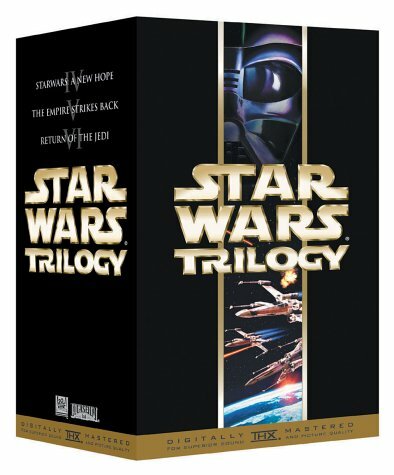 SW Trilogy VHS aspect ratio? Discussion in 'Archived Threads 2001-2004' started by Jeff Cooper, Apr 29, 2002. My local costco just got in a bunch of the Star Wars Trilogy VHS packs, and since these aren't showing up on DVD anytime soon I was thinking about picking it up. However I looked all over the entire package, and NOWHERE does it say if it is the widescreen version or the pannscan version. I also looked on Fox Home Video's web site and it does not mention anything either. Can someone here tell me if these are OAR or MAR? According to the pictures on Amazon (where it's out of stock), the widescreen VHS Trilogy box is clearly marked "widescreen," so i'd assume that the version you saw is P&S. If you can find them, the aspect ratio of the most recent VHS Widescreen release (November 2000) seems to be about 2.20:1. In other words, they're slightly cropped; evidently to try to take maximum advantage of VHS's limited resolution. I still say it's a darn shame that these films are not currently available on DVD, at least in basic form, with the next installment of the Saga only weeks away. Agreed. My local Wal-mart has a big display of P&S VHS trilogies, along with a DVD display of Episode 1. How very sad. I have the SW Trilogy in VHS widescreen and each video's box is clearly marked as "Widescreen", plus they of course are THX digitally mastered. By the way,when and if you buy them in WS, the transfer is outstanding! I watch them on a 58" Pioneer Elite 16X9 RPTV and the image is very good ("for VHS") and very enjoyable. The sound is very full and expansive too. This particular VHS Trilogy release is the most recent one, with the 'Ep II footage'. The individual cases for the movies are covered by a what looks to be like a plastic slipcase, so I can't see if the individual tapes are labeled as widescreen. However there is no mention whatsoever on the slipcase if they are widescreen or not. I know the older VHS trilogy with the Gold or Silver case was clearly labeled as Standard or Widescreen, but this is not that one, it is the newer one. So with that extra info, can anyone confirm if this is OAR or MAR? Agree with everyone that these should be on DVD already! The box for this set has two black sides and two white sides. On one of the white sides (I believe the side that has a picture of Threepio), "WIDESCREEN" will be in gold lettering if it is the letterboxed set. 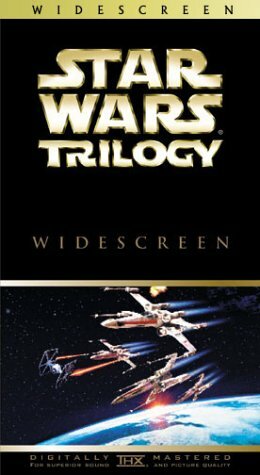 If it is not clearly labeled "WIDESCREEN" on one of the white sides, it's pan and scan.....unfortunately, Wal-Mart doesn't seem to be stocking ANY of the letterboxed sets, even though they did when the SE Trilogy first hit video. I just ran across one at the local Hastings, and am still pondering whether or not to buy it or just wait till I can get he LDs. Good thing I didn't give in to the dark side! I can confirm that the widescreen Special Editions are, indeed, cropped probably to around 2:20 as previously mentioned (or maybe even 2:25). I just measured with tape on my TV. I don't see why they wouldn't keep them at 2:35 since they are so close to it anyway!? The Special Editions I have are from 1997, but I assume the current ones are the exact transfers. I just measured with tape on my TV. did you account for overscan? I have the Special Edition and the THX remasterred edition in Widesceen on VHS and I have not watched these since buying a DVD player. I too wish there were a basic version on DVD as I just don't consider my VHS movies as films in my collection anymore. When thinking about the new film coming out, I think of watching Episode I, not IV, V, VI - not because it's superior (hah) but because it's on that silver platter. Limited resolution 2.0 sound? No thanks. Doesn't limited resolution 2.0 sound come out sounding like pretty doggone good surround using DPL II to enhance it? I've heard it does, but don't have a DPL II A/V receiver yet. All I did was put in a 2:35 DVD, then switched to Star Wars VHS. The tape markings on my TV indicated a slightly wider picture for the DVD, which was 2:35. The "black bars" were thicker (or higher) for the DVD albeit slightly. I think it's been confirmed at many sites that both the 1997 and 2000 VHS Widescreen releases of the Original Trilogy were slightly cropped to around 2.20:1. This was also true of the April 4 2000 VHS Widescreen release of Episode I although, thankfully, LucasFilm provided us with a DVD of that film on October 16 2001 (18 months after the VHS release), so it no longer matters. I settled the issue for myself and bought this from eBay. $75, plus $8.50 shipping from Canada. SEALED. From a seller with zero negative or even neutral feedback. Expensive, but potentially worth it. I will let you all know how it is! That's a great set you bought, I'm sure. I've thought about buying a set on there before. But, I guess the widescreen Special Editions will hold me over. Hello all. I too have that VHS Boxset as an extreme backup to my laserdiscs. Speaking of which, are the SE Laserdiscs also in this cropped form? I haven't had the chance to compare the SE to my THX Original Trilogy discs. That's a great set. I just got mine last October through my company for $30 !! It has an interview before each movie with George Lucas, conducted by Leonard Maltin. The quality is excellent, for VHS. I bought this because I decided against buying a whole LD set up this late in the game. I'm going to buy a JVC SVHS player later this year to get the most out of these and what's left of my kids VHS library. For now, my Onkyo 696 upconverts composite to S-Video and is doing nicely as an interim. BTW - DPLII makes a big difference. It's not 5.1, but it's enveloping and enhances the experience so that you aren't constantly thinking about the soundtrack/effects or lack thereof. Still would rather have the DVD's, but it will do.